What's all the fuss about 1 click install? 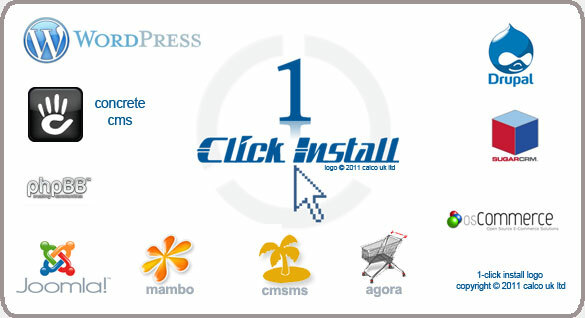 1 click install is included in our 99 pounds per annum hosting package. The programmes listed below are all free for you to install and use with literally one click of the mouse. This means at the present time, not only do you get the best hosting available you also have an on-line updated library of industry leading applications any time you want them. We got a call from a customer who needed a website set up that day. We asked her to prepare the text and a few images. While she did that we acquired a domain and installed the hosting and a short while later, the email address and Wordpress 1-click install. We then called the customer to let her know that her website with dummy content was ready for use. She updates her website herself every day now. At the other end of the Wordpress spectrum, we use it ourselves for complex data driven websites where client interaction is required. The huge number and variety of add-on components called plug-ins makes this task easy as there is a plug-in for almost any web task you can think of. New applications are added to the library as they become available and will appear in your control panel automatically!